HCM CITY (VNS) — Land erosion is becoming severe in the Cuu Long (Mekong) Delta, affecting the lives of thousands of people. In An Giang, one of the most flooded provinces in the area and the hardest hit by erosion, several cases of erosion have occurred recently. For instance, the erosion of a river bank in Tan Chau town's Long Chau Ward caused 8,000sq.m of soil along a 100m stretch to fall into the Tien River on Monday. In Long Xuyen town's My Hoa Hung Commune, 250sq.m of land plunged into the Hau River last Tuesday, causing 17 fishing cages to sink. An Giang has around 50 erosion hot spots with a total length of 150km along the Tien and the Hau - two tributaries of the Mekong - and other rivers. Some 6,000 households in An Giang now live in vulnerable areas and await relocation to safer areas. The province has taken many measures to prevent erosion, including building erosion-proof sites and raising awareness of erosion sites. Do Vu Hung, deputy director of the An Giang Department of Agriculture and Rural Development, said his department encouraged people living in erosion-prone areas to move to safe areas. This year's flooding caused by the rising level of the Mekong is expected to peak in the first 10 days of October and the waters will rise to an estimated third warning level, according to the National Centre for Hydro-Meteorological Forecasting. This means that though the flooding has been moderate this year, the erosion has been unusually severe. Illegal sand mining and construction of houses and other structures along rivers are the major causes of the erosion, experts said. In Dong Thap Province neighbouring An Giang, 25 cases of erosion have been reported in Hong Ngu, Thanh Binh, and Chau Thanh districts and Cao Lanh city so far this year, causing a loss of 26,106sq.m of soil and affecting nearly 2,000 households who need to be relocated. Erosion has occurred along a total length of 39km in 34 communes, wards, and towns in Dong Thap, threatening 4,000 families. Erosion of earthen sea dykes and land along coasts in coastal provinces like Tra Vinh, Kieng Giang, and Ca Mau has also been increasing. Le Thanh Trieu, chairman of the U Minh District People's Committee in Ca Mau, said the Khanh Hoi estuary eroded 50 meters of land every year, threatening the safety of 500 families living along it. Khanh Hoi Commune authorities have had to use wooden stakes and sandbags to check the erosion. They have also urged provincial authorities to build embankments to prevent the erosion at an estimated cost of more than VND100 billion (US$4.76 million). In Tra Vinh Province, the Ministry of Agriculture and Rural Development (MARD) has approved construction of concrete dykes since 2008 at a cost of more than VND530 billion ($25.2 million). But to build a comprehensive dyke system to protect residents, Tra Vinh needs at least VND1.5 trillion ($71.4 million) , according to its People's Committee. Cao Van Nam, head of the Kien Giang Irrigation Sub-department, said the destruction of coastal protective forests is the major reason for the erosion of sea dykes. "Erosion will worsen if there is no measure to recover and develop coastal protection forests outside dykes," he warned. Kien Giang has been trying to replant protective forests in erosion-prone areas, but achieved limited results due to reasons like unsuitable cultivation models and the adverse impacts of aquatic farming and fishing. 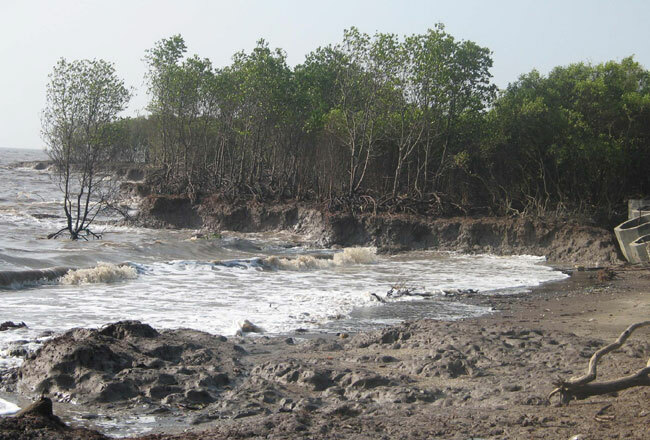 MARD has called on research institutes to evaluate the phenomenon of coastal erosion and find solutions to prevent it, create silt deposits in coastal areas, and plant trees to check the sea.